Color adds so much to a wedding! Classic whites and creams are always timeless but a vibrant color scheme truly says tropical destination wedding! This wedding at Casa Del Mar, a villa within Fiesta Americana Resort, took place in the fall and the bride described her vision of the wedding as tropical-chic with bold autumn colors of deep red, rich purple, and a vibrant gold. In the bride's own words, she chose this location for a variety of reasons: "It was the perfect fit.for an intimate wedding of our closest friends. It also offered the best of everything…we .were able to have a wedding near the beach, but didn’t have to be ON the beach. Instead, .we got married in the garden area overlooking the ocean. We loved the intimacy and convenience of Casa Del Mar. It was completely private and our guests didn’t have to fuss from different locations for the ceremony and then the reception. It also didn’t hurt that we had a beautiful beach backdrop yet were able to still get married on the grassy lawn, so our .guests didn’t have to get messy in the sand." 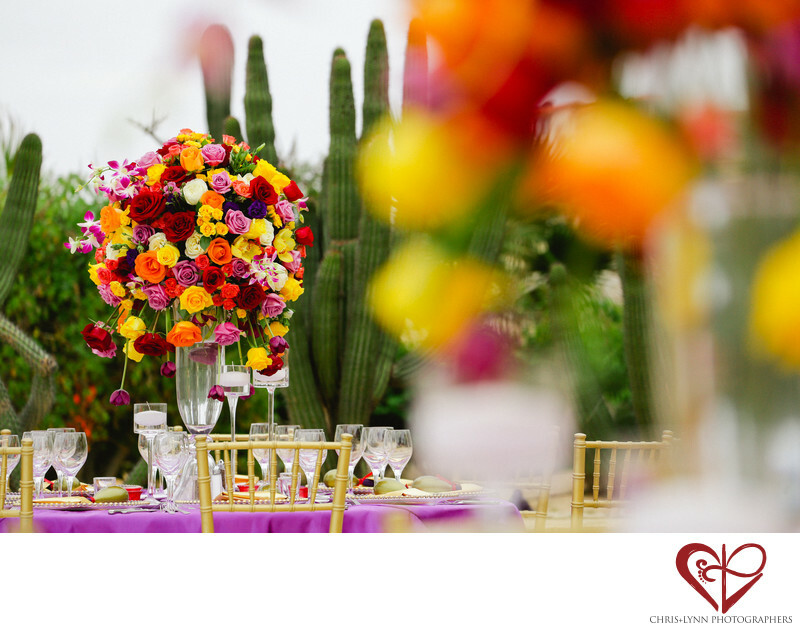 The couple's wedding day iteslf was cloudy, rare for Los Cabos, but it made the colors of the decor and flowers stand out even more! We always photograph all the reception details when everything is set up since the couple rarely get to see everything without the guests. This design and decor were by the wonderful Karla Casillas and Co with The Main Event Cabo. The wedding was featured in Destination I Do Magazine. 1/800; f/5.0; ISO 400; 176.0 mm.